Japanese online brokerage firm Monex Group Inc will buy Coincheck Inc, the exchange at the center of a $530 million digital money heist, for 3.6 billion yen ($33.6 million), the latest move by a mainstream finance firm into the cryptocurrency market. Monex, Japan’s No.3 online brokerage by customer accounts, said in a statement on Friday it would buy all Coincheck’s shares on April 16 in a move that will allow it to access Coincheck’s trading platform and customer base. The deal comes amid regulatory pressure for tighter standards at Japan’s cryptocurrency exchanges after the $530 million theft of digital money from Coincheck earlier this year. The Financial Services Agency on Friday ordered two other exchanges to halt operations and told a third to make improvements over lapses. The punishments came after it ordered Coincheck to shore up consumer protection and curbs on money laundering. An FSA official said it would make thorough checks on whether Coincheck implements an effective management system under Monex’s ownership. The Monex deal shows major Japanese financial firms still see growth in the booming domestic cryptocurrency market, despite security and regulatory risks. Monex’s larger rival SBI Holdings Inc last year won a license to run an exchange, but in February postponed plans to do so as it sought to bolster security. Messaging app operator Line Corp is also seeking to open an exchange through its financial arm. 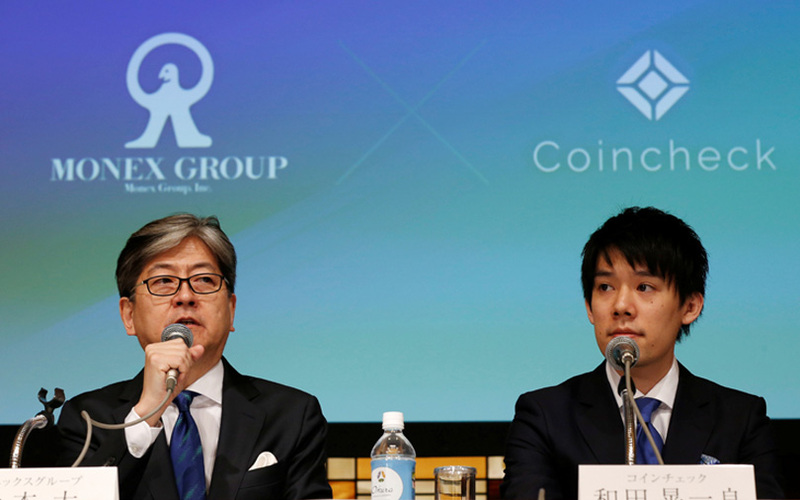 Monex aims to launch an initial public offering of Coincheck shares in the future, Matsumoto said, in what would be the first such listing by a Japanese cryptocurrency exchange and another example of a crypto-related business going to market. China’s Canaan Creative, one of the world’s largest cryptocurrency mining equipment makers, said on Friday it was considering an IPO outside the mainland as demand for its kit surges in a global boom in the asset. Shares in Monex surged 20 percent on the deal - the maximum allowed under Tokyo Stock Exchange rules - to close at their highest in five years. The shares have risen by 40 percent since it said on Tuesday it was looking the deal. In a rare look at the finances of a Japanese exchange, Monex said Coincheck generated sales of 980 million yen ($9.1 million) and net income of 471 million yen in the year ended March. Still, the exchange’s market share has shriveled since the heist, falling to 8.9 percent of Japan’s bitcoin trading volume in March from 55 percent in December, according to Jpbitcoin.com. CEO Koichiro Wada and COO Yusuke Otsuka will both resign from Coincheck’s board of directors to become executive directors of the firm. Wada, 27, stands to make 1.6 billion yen ($14.91 million) from the sale of his 45.2 percent stake, according to Reuters calculations.